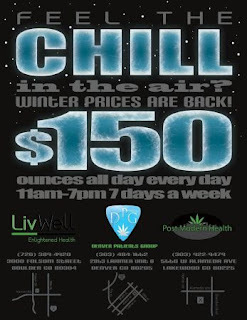 $150 for ounces of weed at Post Modern Health on Alameda in Lakewood, LivWell Enlightened Health of Boulder and the Denver Patients Group (DPG) on Larimeir in the Downtown Denver area. These dispensaries are all under the same ownership, so you can expect the quality of the cannabis at these Colorado marijuana dispensaries to be about the same. Where is this Colorado MMJ Special Valid? To help you get the most of this winter dispensary deal we put together a map featuring the three dispensaries taking part in the deal.